Quite some time ago I had an idea to start a new podcast, an interview-based show. The idea was mostly born of loneliness. Business loneliness. Isolation is common among solopreneurs. Since 2008 I’ve been on my own solopreneur journey. About a year into it, the isolation hit me fairly hard, but it was profitable because from that sensation was born this idea. I was listening when Cliff “PodcastAnswerman” Ravenscraft launched his cleverly branded podcast in 2006. I was a fan of podcasts because mostly I was an audiophile and I loved electronic gear. I had built my own little studio (since named The Yellow Studio because the walls are mustard yellow), but podcasting wasn’t the initial objective. I’m a Christian and I was doing some web work and other things that were church-related. Posting sermons online, doing some audio editing and interviewing folks…those were the real objectives. It just so happened that the stuff I used in The Yellow Studio were the very things that made for a professional sounding podcast. Mixers, microphones, vocal strips, a telephone hybrid and a broadcast workflow were ideally suited for this relatively new thing, podcasting. I faithfully listened to Cliff’s show because he was geeky and I shared his passion for the art of podcasting. I also listened to other guys who were more into the professional audio gear. They were more in my wheelhouse early on because I had spent my entire adult life in the electronics business. I was also a longtime audiophile (stereophile, really). The voiceover community had always fascinated me and many of them had killer home studios. Guys like Mark Jensen over at New Media Gear did product review type shows. In those days, gear envy drove a lot of us. It still does, but some of us have learned to temper our enthusiasm for the tools. Driven by the desire to simply “pass it on” I launched a podcast at Leaning Toward Wisdom. You won’t find any of the back episodes now. I rebooted the entire site just recently and there is only one episode there now. But that was where I posted my first podcasts. Shortly after that I launched at Bula Network, my home base. Given that the company name was Bula Network, LLC it just made sense. At no time was there any motive or plan to create a business of either podcast. I was simply an experienced guy sharing ideas, thoughts and opinions – primarily aimed at my now grown kids. Honestly, it was about legacy of knowledge and wisdom. It was my little way of being virtual for those I love the most, my family. Well, back to the Chasing DFW Cool story. But, this is the first time I’ve launched an interview-based show and it’s the first time I’ve launched a show with so much as a sniff of a business idea behind it. No, it didn’t start out that way, but I admit I’ve given some thought as to how I might be able to at least have it pay for itself. I’m not looking to create some money making machine. I’m just thinking of how I might earn a few thousand bucks a year to have the thing pay for its own way. And if it doesn’t, then that’s okay, too. Back in the 70’s when I went to journalism school we had many classes that focused on interviewing. Other than tedious research, interviews are how journalists gather stories. It’s all that who, what, when, where, why and how stuff you learn in Journalism 101. 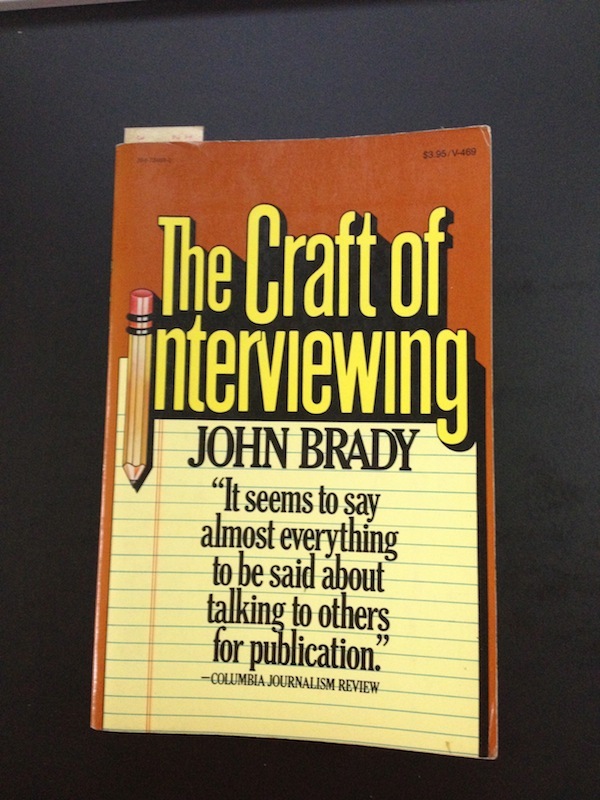 One of the first books we were required to read was a book entitled, “The Craft Of Interviewing” by John Brady. Brady was then the editor of Writer’s Digest. The book was published in 1976. I’ve still got my original copy (pictured there to the left). I knew I wanted to interview people because I wanted to make connections. Not with some ulterior motive in play…just because I wanted to hear the stories of what other people were doing. Some words transcend the times. Others, not so much. “Dig” is one that didn’t transcend the times. It sound corny today when I hear people use it. Come to think of it, when it was popular it sounded corny, too. To me, at least. What is cool? It’s whatever you think is awesome, unusual, extraordinary or interesting. At least that’s how I’m using it for this new podcast. I’m going to ferret out the people in the Dallas/Ft. Worth area who are cool people doing cool things. Okay, maybe they won’t all be cool, but their work will be. We usually find people interesting if they’re doing interesting things. Funny how performance and action determine those things, right? There’s a lesson there for all of us I suspect. I live in Dallas/Ft. Worth, Texas. Remember, isolation was the impetus for this idea. One day I realized, “Hey, moron. You live in one of the biggest, most vibrant cities in the country. Why don’t you get out more?” Yes, I call my names when I talk to myself. It makes me less anxious when I call other people names. So the purpose (see above) was to tell cool stories of people doing cool things right here in the metroplex. One side benefit would be for me to get out more and connect more. But a big part of it was for me to focus on people who only had one thing in common. They live and work here in DFW. Sometimes we all need a whack up side the head. Or, a kick in the pants. This is sure to do it for you. Not long ago I stumbled onto a vlog (video blog) by a young guy in North Carolina, Ty Moss. He has over 80,000 YouTube subscribers. That prompted me to dig just a little to see which YouTubers had the most subscriptions and to see what kind of content they were producing. Some of them I was already familiar with, but most were completely foreign to me. Stick with me here. One of the few I knew about was Blimy Cow. They have over 186,000 YouTube subscribers. In fact, they just launched their audio only podcast over at Apple iTunes and rocketed to a top position with dozens of reviews. All with a single podcast episode. ShayCarl has just over 1 million subscribers…well, to his main channel. The ShayTards channel has about 1.3 million. The ShayLoss channel has a bit over 300,000. He’s got quite the franchise going. I admit it, I’ve watched it more than a few times. sWooZie has over 1.25 million YouTube subscribers. Extremely high production elements. Very entertaining, too. DailyGrace has more than 1.5 million subscribers. Toby Turner has almost 1.6 million YouTube subscribers. DanIsNotOnFire has almost 1.9 million. CharlieIsSoCoolLike has almost 2.1 million. You think these are the top ones? Nope. Let’s stop playing around with chump sized audiences though, shall we? Nigahiga has about 9.2 million subscribers. RayWilliamJohnson has almost 9.6 million. JennaMarbles has about 9.8 million. Smosh has 11.1 million. They’re the current #1. They’re adding almost 120,000 new subscribers every week. The most current rankings, according to VidStatsX, can be found here. To give you some perspective, WheezyWaiter (one of my favorites) has yet to break the half million mark. He’s currently at about 467,000. But let me give you a bit more perspective. Lockergnome guru, Chris Pirillo has about 294,000. Perhaps one of your all-time favorites, Pat Flynn has just over 20,000 while social media rockstar Chris Brogan has slightly over 3,000. Are you learning anything yet? Yeah, me too! The point isn’t whether these people are worthy of their audience or not. The fact is, these are the audiences they’ve got. At least on YouTube, which is still the number 2 search engine on the planet behind Google. Here’s the point. There is a much bigger world than the one you occupy daily. Those folks you follow on Twitter. The ones whose blogs you read and who have podcasts you listen to…they’re not the only people on the planet drawing a crowd. Fact is, they’re not likely even in the top tier of people attracting attention and building an audience. Lady Gaga is 27. According to Forbes she’s earned $80 million through June. Not a bad first half. She’s got 38 million Twitter followers and 58 million Facebook fans. Boy, am I feeling microscopic these days! I just mention those numbers to give you some perspective on how vast the world is and how vast the popularity is of people that you may care nothing about. It’s likely that the people who influence you the most are rockstars in a very small pond. It’s also likely that the pond in which they swim is very large to you.